4 People not profit Saltburn‘s social justice party starter‘s return to Saltburn this December after two events in the Boro, at a popular club The Empire and an outdoor event in Middlesbrough town centre. 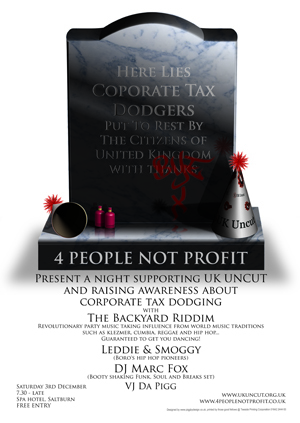 4 people not profit present a night supporting UK Uncut and raising awareness about corporate tax dodging. The event will be on the 3rd of December at the Spa hotel, starting at 7.30pm till late. The event is free entry although donations are welcome towards a 4 people not profit festival next year. UK Uncut are a grassroots anti austerity action network who have been active since the coalition government came into power and started cutting public services drastically to pay for the recession caused by the banking industry. They argue that these cuts do not need to take place if banks and corporations paid there fair share of tax which currently is disappearing out of the country into tax havens. UK uncut have raised awareness of this issue by a variety of campaigning direct actions such as staging ‘bail-ins’ where teams of UK Uncut volunteers have been entering banks, occupying them and transforming them into something that people need that will be damaged by the cuts. As UK Uncut state ‘The brutal cuts to services being inflicted by the current Government are unnecessary, unfair and ideologically motivated. The coalition are particularly fond of two obscene catchphrases: ‘There is no alternative’ and ‘We’re all in this together.’ Both slogans are empty and untrue. The cuts will dismantle the welfare state, send inequality sky-rocketing and hit the poorest and most vulnerable hardest. A cabinet of millionaires have decided that libraries, healthcare, education funding, voluntary services, sports, the environment, the disabled, the poor and the elderly must pay the price for the recklessness of the rich. At this event we have a stellar line up of fantastic talent. Headlining we have from Newcastle The Backyard Riddim who describe themselves as revolutionary party music, taking influences from world music traditions such as klezmer and cumbia, reggae and hip hop guaranteed to get you dancing. These guys have been making some serious waves on the northern festival circuit, including a storming headline slot at the Newcastle Green festival. Joining them will be 4 People not profit favourites and local pioneers of socially conscious hip hop Leddie and Smoggy, who will be taking a break from recording there eagerly awaited debut album. And not to forget our resident DJ Marc Fox will be playing funk, soul, breaks and beats, and VJ artistic wizardry from Da Pigg. This will be a storming event and one not to be missed. So tell all your friends and family and come down and show support that you are against austerity measures that target the poorest and weakest in society while the richest rob us blind through tax havens! And most of all bring your dancing shoes and get ready to boogie at Saltburns first big party of the Christmas season! !